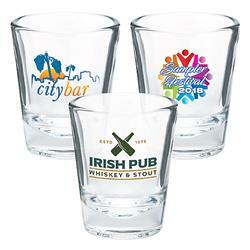 Shot Glasses with Custom Full Color Imprint - 1.5 oz. 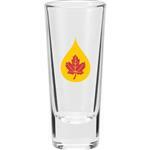 New Shot Glasses with your promotional logo custom printed in full color! Flared Glass, Round Bottom, Circle, Heavy Bottom Base, Tapered Edge. 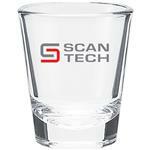 2" W x 3.375" H. A full color imprint on a tapered shot glass - we are proud of this! Production Times Available: 9 working days.